It was a Saturday A-League triple-header that went very well for the city of Sydney. Three games, three identical scorelines and many ramifications. And it continues this stellar season of football where the fans, the players, the administrators and the quality all seem to be in accord. Sydney FC won their fifth home game in a row – a club record – with their 2-1 defeat of Adelaide United. Back in the 90s, when local basketball was at the height of its popularity, the Sydney Kings were known as the Cardiac Kids, for their propensity of making a comfortable game a nail-biter. Sydney FC have assumed that mantle. Cruising at 2-0, they let Adelaide back into the game via a debuting Tomi Juric and an out of position Vedran Janjetovic. In the last 12 minutes, Sydney barely hung on, with signs of panic ensuing at the end. But hang on they did, and backed it up less than 24 hours later with the unveiling of Lucas Neill as a guest player until the end of the season, which for the Sky Blues now might include the possibility of play-offs. So, a win, the jettisoning of one Socceroo and the signing of another. Life’s never dull at Sydney FC. While there may be many ups and downs for the Sky Blues, the one constant is a star shining brighter each week in Alessandro Del Piero. No need to harp on, even non-football fans know how good Alessandro Del Piero is. 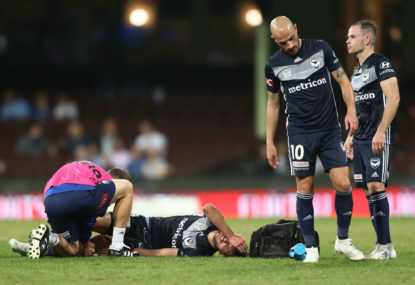 Straight after that, two of the success stories of the A-League faced off in a scintillating match played in a white-hot atmosphere at AAMI Park. Melbourne Victory are the club all others should aspire to be and the Western Sydney Wanderers are doing so in their debut season. How many of us would have predicted that the Wanderers would sit one point off first place with six games to play? 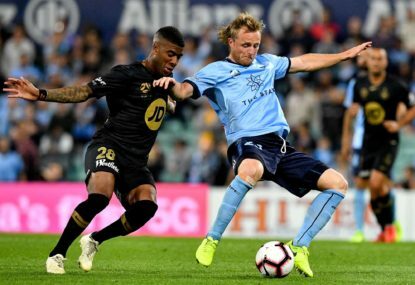 The Victory missed Archie Thompson and suffered from an uncertain display from Marcos Flores, who should have equalised soon after Western Sydney took the lead, after great wing play from Marco Rojas. 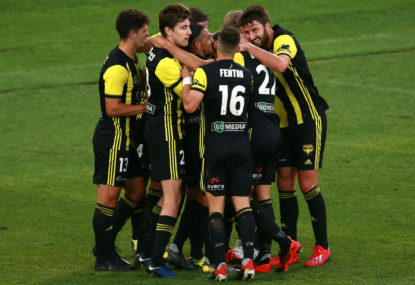 The Wanderers built their win on a resolute back four, with Jerome Polenz outstanding, especially given he “carried” a yellow card for 89 minutes. Youssouf Hersi was quieter than in recent weeks but still made the second goal for Shinji Ono. And it turned out to be the winner as the Victory came steaming home, spurred on by a magnificent crowd, only to fall short. 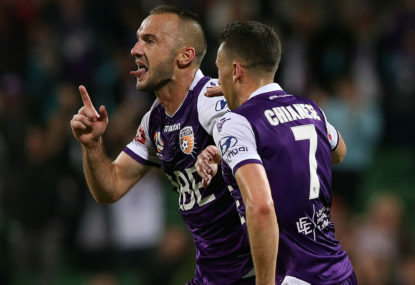 Win achieved, the Wanderers then sat back and watched last-placed Perth Glory turn the form guide on its head by beating leaders Central Coast. New coach Alistair Edwards became the first mid-season appointment to taste a win in his first attempt. The loss meant the Mariners sit a point ahead of the Wanderers, and entertain both they and the Victory before the end of the season. There’s lots to love about this A-League season. 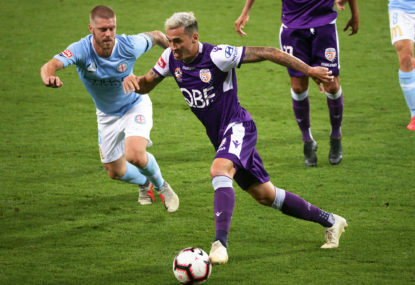 Sydney FC have moved their top-of-the-table A-League clash with Perth Glory from the SCG after Saturday night’s farcical match with Melbourne Victory.